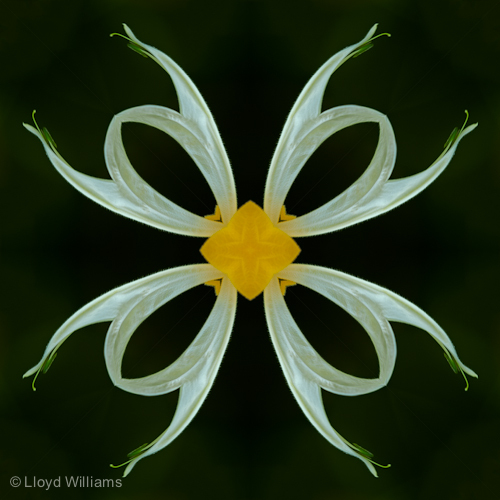 I’ve continued to experiment with kaleidoscope botanicals. I’m especially drawn to the abstract nature of these images. I’ve tried different subjects and different ways of photographing them to make them more amenable to the kaleidoscope treatment. I’ve also tried different numbers of reflections. Creating templates for four, eight and sixteen reflections is straightforward. Others, such as six or twelve reflections, are more challenging, but also produce a hexagonal shape that offers some interesting possibilities. 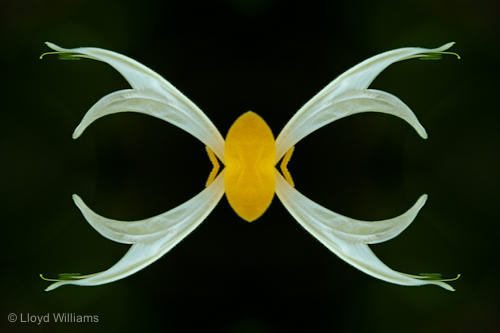 The two images above illustrate different compositional possibilities for a given subject – in this case a flower from a Lollipop Plant (Pachystachys lutea) – using different numbers of reflective elements. The upper image has four reflective elements. I like it with the reflections touching only at the center. To me this image evokes feelings of grace and freedom. The lower image has eight reflective elements. I liked the closed reflections in this one. They suggest figures dancing in a circle. This one seems to me to capture the essence of joy. This entry was posted on Friday, February 25th, 2011 and is filed under Out of the Box. Both comments and pings are currently closed.